It’s not uncommon to see a recreational ATV or side-by-side lifted a few inches. The problem, however, is that suspension boost puts stress on the OEM axle, often causing it to break. That’s why Motor Master developed VooDoo Axles. VooDoo Axles use fixed Rzeppa inner CV joints that allow 45 degrees of articulation, while a slip spline in the axle shaft provides two inches of travel, ideal for ATVs and UTVs with lift kits up to three inches. “The shaft itself plunges in and out. 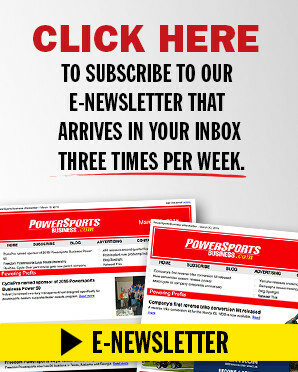 There’s nothing like that in the industry,” Motor Master marketing manager Kevin Kalstrom told Powersports Business. The long travel of the axle helps prevent the disengagement of the inner CV joint from the transaxle when the suspension’s at full droop, and the telescoping bars are carried on linear motion ball bearings that don’t bind under load. The CV housings are forged with grease channels, providing bearing cages with increased lubrication, which prevents overheating at higher angles. And the CV joints start as a precision hot forged mold, which is then cold forged to add strength. VooDoo Axles were unveiled shortly before Dealer Expo, and dealers had a first chance to see them at the Indy event. Dealer reaction was positive, Motor Master reported. “They’re very interested, very interested,” Kalstrom said. Motor Master’s VooDoo Axles are designed for ATVs and side-by-sides that have been lifted up to three inches. The axles are currently available for the 2006-13 Kawasaki Brute Force 650i, the 2005-13 Kawasaki Brute Force 750i, the 2008-13 Polaris Ranger 800 RZR (except the S and 4 models), the 2009-11 Yamaha Grizzly 550 and the 2007-10 Yamaha Grizzly 700. Axles for more models, including the Arctic Cat Prowler, Can-Am Commander, Kawasaki Teryx and Yamaha Rhino are in the works. “We know the XP 900, the Can-Am Maverick, the Arctic Cat Wildcat, those are all the top dogs now, so obviously we’re going to run those down immediately,” Kalstrom reported. MSRP on the axles is $495, but with most modified side-by-sides going out the door with prices topping $20,000-$40,000, dealers didn’t flinch at the cost. “Anybody that is tired of breaking axles and paying anywhere from $150 to $300 for OEM replacement, that adds up relatively quick, so if you get something like this that’s going to outlast them, it’s actually a savings in the long run,” Kalstrom said. Motor Master has used its 13 years in the ATV industry, along with its parent company’s decades of experience in the automotive market to develop these axles. 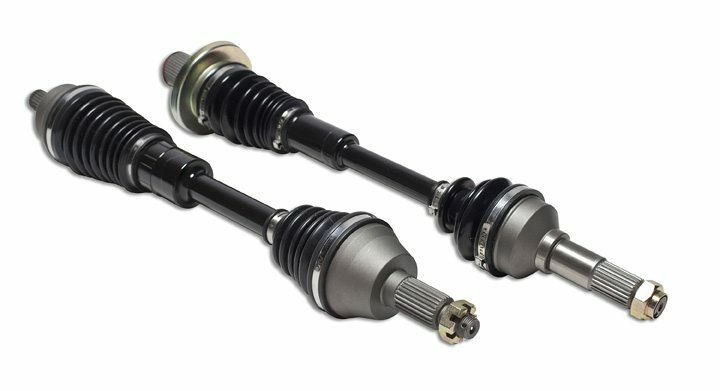 Though the axle is sourced with parts from a variety of places, including China, it is assembled at Motor Master’s Rockford, Ill., facility, and has undergone extensive testing before being put to market. But Motor Master is most looking forward to gauging customer use, now that the axles have been made available.